Foil DuraBlack blank labels are strong and lightweight, and flexible enough to adhere to contoured or uneven surfaces. The foil label will fracture if removed from its mating surface, serving as an effective security feature for asset tracking and product identification labels, property ID tags and more. 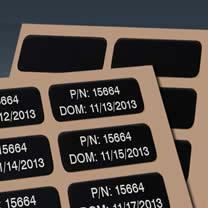 Why Choose MPC's Foil DuraBlack Blank Labels & Tags? .005" anodized aluminum face stock.